ASUS X751MA-DB01Q is a 17.3 inch modern laptop with an entry level 4th generation Celeron N2930 processor that is much faster and power efficient than the Intel Atoms and adequate for any daily tasks other than complex software and advanced games, ample space of storage at 1TB, lots of memory for multitasking- 8GB, a large 17.3 inch HD+ screen, Asus SonicMaster audio and connectivity ports including a USB 3.0 port, Bluetooth, HDMI, DVD Drive and more. ASUS X751MA has the quad core Haswell Bay Trail-M Celeron N2930 processor with a speed of 1.83 GHz up to 2.16 GHz with Turbo Boost, 8GB DDR3 RAM at 1600 MHz to have several apps, programs and browsers open and run at the same time successfully without freezing, 1024GB SATA hard drive at 5400rpm spindle speed (fast read and write times and lots of storage space for all your multimedia and common files) and 64-bit Windows 8.1 Pro pre-installed. The Intel Celeron N2930 offers four way reliable processing power for everyday mobile computing as it is a quad core processor that competes with processors like AMD Kabini A4-5000, it doesn’t have the hyper threading function but the Turbo Boost that takes the speed from 1.83 to 2.16 GHz when needed. 1TB is quite a lot of storage but when you need to have access to your more important stuff when you’re away from your PC at another location, you have the lifetime 3GB Asus Cloud WebStorage for convenience to be able to access from smart phones and tablets as well, wherever there is internet. Glossy 17.3 inch High Definition Plus (HD+) widescreen display with 16:9 cinematic aspect ratio, 1600 x 900 native pixel resolution and Intel UMA Graphics offers very clear and realistic images with fine detail and beautiful colours while SonicMaster Audio through the stereo speakers deliver crystal-clear sound. VGA webcam with integrated microphone for easy video chats with friends and family. 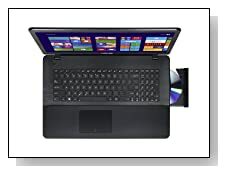 It has the Multiformat DVD/CD Drive with double-layer support you can record lots of data and hours of video with and an HDMI port that you can use to connect your already large screen PC to an even larger screen HDTV for better viewing options. We don’t have information on Bluetooth but comes with 3-in-1 Multiformat Media Reader that supports Memory Stick, MultiMedia Card and Secure Digital formats to transfer multimedia files from other devices, 2 x USB 2.0 ports, 1 x USB 3.0 port for up to ten times quicker data and multimedia transfers than the standard USB 2.0, High speed 802.11b/g/n wireless LAN, 10/100/1000 Mbps Ethernet with RJ-45 port, VGA port, HDMI port, DVD Drive, 1x Headphone-out & Audio-in Combo Jack and VGA webcam with microphone. 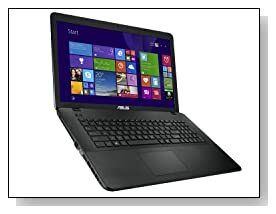 Black ASUS X751MA weighs 6.2 pounds and has the measurements of 10.70 x 16.30 x 1.40 inches so it is relatively slim and lightweight for a 17 inch laptop with a DVD Drive (more for occasional movement and as a desktop placement) but not if you compare it with smaller screen laptops. Battery life from its 6-Cell 47WHrs lithium ion battery is at approximately 4 hours in normal daily use which is not great but not bad. It comes with the chiclet-style keyboard that is comfortable to type on with also a 10-key numeric keypad for easy number crunching. Conclusion: Asus X751MA-DB01Q is a low cost machine despite being a 17.3 inch HD+ display computer with large amounts of memory and hard drive as well as multimedia and connectivity options. The weak link here is the Celeron N2930 processor which decreases the PC’s price and is still quite sufficient for daily tasks. It is suitable for school, work, multimedia and entertainment at home being able to handle low to medium level applications, you can’t play the latest games as neither the Celeron CPU nor the Intel UMA integrated graphics is adequate for that purpose, but you’re OK with lighter games. Asus is one of the most trusted computer brands for their good quality computers with solid build. The X751MA comes with a 12 month limited parts and labor warranty.